The new Student Pavilion at the College of the Sequoias was designed by TETER Partner and Architect Stan Canby and is featured in the EDUCATION PROJECT FOCUS section in the July 2018 edition of Metal Construction News. “TETER LLP designed College of the Sequoias’ student pavilion on an existing open lawn area to become a centralized focal point on its Hanford Educational Center campus. The 43,000-square-foot pavilion and amphitheater are constructed with a steel structure, metal roofs and perforated metal wall panels. TETER designed the open-air structure to meet multiple objectives. The student pavilion connects campus buildings, provides year-round, shaded shelter, establishes an entertainment space, encourages peer collaboration and allows for flexible teaching configurations. The pavilion’s roofs are supported by a geometric pattern of triangulated steel pipe columns. The steel pipe columns give it visual drama and coordinate with the main campus entrance. Access to the pavilion is straight ahead when entering the campus core between two large campus buildings. The buildings are connected with an angled pipe brace structure supporting a flat roof. The braced pipe roof supports echo the pavilion’s pipe support system. 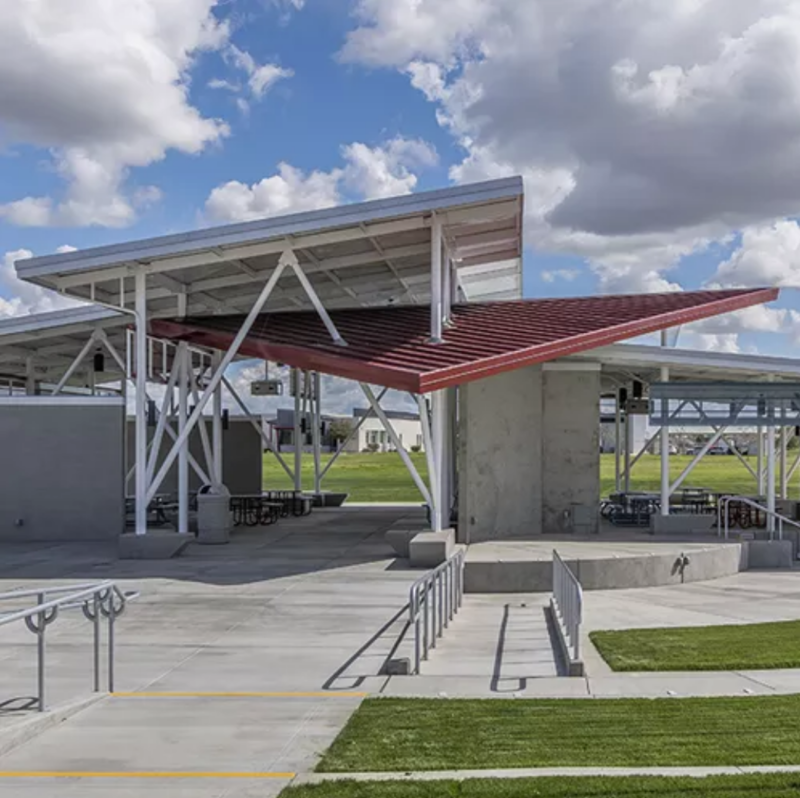 The pavilion’s exposed structural steel and the underside of the metal roof were painted with Sherwin-Williams Coil and Extrusion Coatings’ (formerly Valspar Corp.) High Reflective White paint. Standing seam roof panels are attached to three roof planes. The largest two roof planes cover the main pavilion floor area. One slopes up and appears to overlap the other, which slopes downward in the opposite direction. An off-center intersection of the upper and lower roof planes creates a clerestory, which provides ventilation to the covered areas below. The third roof plane is triangular, oblique and slanted. It extends over an elevated stage for events addressing an amphitheater audience. “The triangular roof plane intersects the two main roof planes in a skewed fashion, appearing as a visual anomaly of interest from all vantage points,” Canby says. Golden State Steel fabricated the structural steel. Mid-State Steel Erectors Inc. installed the structural steel, metal roof and wall panels. The project utilized 5,959 square feet of AEP Span’s 16-inch-wide Span-Lok HP standing seam roof system in Zincalume Plus and Cool Colonial Red. For the upper roof and its perimeter fascia, Mid-State Steel Erectors installed 2,643 square feet of panels in Dura Tech 5000 Zincalume Plus. For the lower roof and its perimeter fascia, the company installed 2,656 square feet of panels in Zincalume Plus. For the oblique roof and its perimeter fascia at the stage, Mid-State Steel Erectors installed 660 square feet of Span-Lok HP panels in Dura Tech 5000 Cool Colonial Red with a clear coating. For screenwalls, Mid-State Steel Erectors installed perforated metal panels on angled pipe bracing at the exterior column lines. It installed 200 square feet of Steelogic LLC’s US-06 metal wall panels in Red, which matches the stage roof’s Cool Colonial Red, and 175 square feet of US-06 panels in Blue, which matches an adjacent building. The panels are perforated with a 40 percent open area and the project was completed in September 2017. One challenge was fitting the pavilion and amphitheater into the topography. The pavilion is at the lowest point of a 4-acre, lawn-covered pond basin. The floor level of the structure is 4 feet below surrounding buildings. “The solution was to design ADA ramps for access to the structure’s main floor level,” Canby says.